The second phase of the Seri Tanjung Pinang (STP) development project, which has a gross development value (GDV) of RM25bil, is expected to generate RM9.75bil worth of construction and renovation jobs for the local construction industry. Penang Master Builders and Building Materials Dealers Association president Datuk Lim Kai Seng told StarBiz that about RM2.25bil would be generated from renovation works. “The remaining RM7.5bil would be spent for construction and building materials,” he said. Lim was commenting on Eastern & Oriental Bhd’s plans to undertake RM25bil worth of residential and commercial projects to be carried out over 20 years for the second phase of STP. This would involve reclaiming 307ha (760 acres) of landbank in Tanjung Tokong. The first stage of reclamation involved reclaiming 102ha (253 acres) of land, while the second stage, 507 acres. E&O managing director Datuk Terry Tham had said that the first stage of reclamation would take about 30 months to complete and 10 years to develop the residential and commercial projects with RM8bil GDV. Lim says about 60% of the construction and renovation jobs could be tendered out to Penang based contractors. The second stage of reclamation will take four years to complete and 14 years to develop projects with a GDV of RM17bil, according to Tham. “The RM8bil GDV of projects for the 102ha (253 acres) land would generate RM2.4bil worth of business opportunities for the local construction and building materials supply industry during the 10 years development period, creating at least RM720mil worth of renovation jobs. “The RM17bil worth of projects for the 205ha land would generate RM5.1bil worth of jobs for the local construction and building materials supply industry during the 14 years development period, generating at least RM1.53bil worth of renovation jobs,” he said. Lim said that the value of construction jobs was about 30% of the project’s GDV, while the value of renovation work, about 30% of the construction cost. About 60% of the construction and renovation jobs could be tendered out to Penang-based contractors. “Most of the jobs for Penang-based contractors would involve the supply of raw materials and the provision of mechanical and engineering jobs. “The remaining 40% would usually be outsourced to Kuala Lumpur-based contracting firms that provide specialised jobs, especially for the commercial projects,” he said. On the latest Construction Industry Development Board Malaysia (CIDB) report, Lim said the number of projects from the private and government sector awarded in Penang would remain flat. 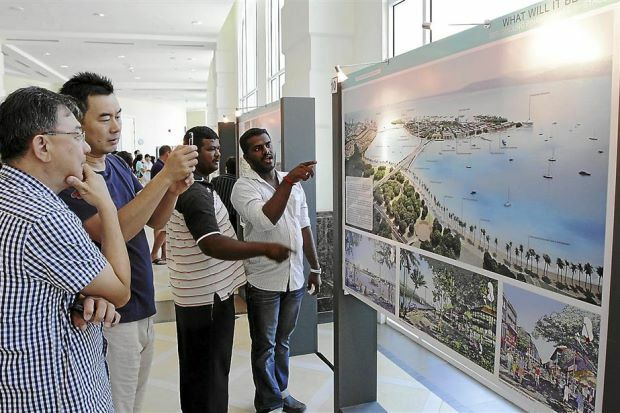 “For the first half of 2013, the number of construction jobs from the private and government sectors given out in Penang totaled 149, compared with 147 in the same period a year ago. “Last year the overall number of private and government jobs given in Penang was 543. We expect the figure to remain more or less the same for 2013. For the first six months of 2013, the value of the construction jobs given out registered at RM3.79bil, compared with RM1.33bil a year ago same period. “Due to the rising cost of building materials, we can expect the value of construction jobs to rise significantly this year,” Lim said.